Famous works: Muna Madan, Sakuntal, etc. Poems: Yatri, Garib, Marga, etc. Essay collection: Laxmi Nibandha Sangraha, etc. Born on the festival of the Goddess of wealth "Laxmi Puja" and so named as a present from the Goddess Laxmi, Laxmi Prasad Devkota turned out to be wealthier in knowledge and wisdom rather than in money and riches. His works are filled with the love and belief in human goodness. His numerous poems, classics, essays and dramas are portrayed with feelings of nationalism, romanticism, and his belief in humanity. Laxmi Prasad could write anywhere and everywhere. No other Nepali writer has been able to produce as many poems as Mahakavi Laxmi Prasad Devkota. But perhaps his greatest possession was his heart as it said that he would give out all he had to the poor and needy although he himself was not doing very good economically. Laxmi Prasad was even given the post of Minister of Education a year before his death, but he gave this up for his love of the Nepali literature. They say that if his works had been translated into English he might have received the Nobel Prize for literature. 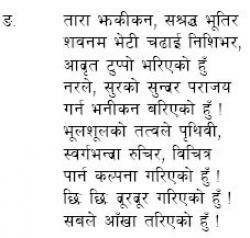 Written by: - Laxmi Prasad Devkota. David Rubin. Nepali Visions, Nepali Dreams. Library of Congress catalog: PK2598.D37A27. to me it's Helen and Padmini. I wept for three days. sent me off to Ranchi. your flesh isn't dead yet! friend! Your piety my sin. At breaking the backbone on the people's rights. like the teeth of Bhimasena. a fire burns in my mind. thoughts stay within the mind. how shall I combine these? could not tie your feet. but cannot hold you back. as precious as her love? their voices are in my mind. The music moves my feet Muna. and I have a heart. I will cross those angry floods. as they play on barren hills and fields. even tears do not have strength. poles with flags are death. and Lamas with shaven heads. before gurus with sunken eyes. there is a soft tearful drizzle. even a flickering lamp is bright. Do not with lust, spoil it. do not try and corrupt it. and tell them your words. ill mother, Muna's eyes large with weeping. At night he was unable to sleep. A buffalo dragged me down! the darkest buffalo dragged me down. has come into our home. maybe this is why he has not come. Madan falls ill with cholera on the road home. to the crows and vultures! My friends, I will not die yet. God will give you salvation. wind sleeps, birds are quiet, it is cold, he falls. Is this fire going to kill the dead? Is it a robber or a thief? Madan decides to call for help. I am holding your feet. and the lineage he brings. The Tibetan carries him to his house, rests him on wool, gives him water and kindness, searches for herbs, crushes them, and makes him drink. He gives Madan yak milk and makes him strong. At Madan's home tangerines are in flower, thoughts are soft and sad. Tell me, how could you forget? Which hateful god took you? I cannot see, hills are covered by curtains. The image I see of you is empty. in my sleep. I have no wings to fly with. I cannot search for my love. and stayed in that city. Dust don't touch, thorn don't hurt. Madan wants to thank the Tibetan by giving him some of his gold, but the Tibetan refuses material rewards. What will I do with yellow gold? nor will it give them warmth. Chance blessed and I have helped. I will not barter goodness for wealth. to pray for my children. She reaches out to Muna. to cross the river, don't weep. the rich and those who suffer poverty. Earth has to meet the earth. stand against it, do not fall. I have done with me. I will take with me. but is Madan not coming? the old woman asked him not to weep. a crow screams, travelers stare at the peaks. Madan looks at the crow. Did you see my city? My house is clean in that valley. go to Muna, she is bright. go, eat, and tell them my story. There is strange screaming in the city tonight. and a young broken tree. The old woman's breath struggles. Why did I come, mother? What did I come to see? My mother, you have torn my chest. Look at my face, mother, look at me. I have come. I have sinned. Look at me. look at me. See me cry. Comfort me. take care of you mother. don't point towards the skies. Madan goes to his sister when he cannot find Muna. Tell me, sister, tell me, where is my Muna? My mother is dying, but I do not see her. when you left and did not come back. She left my mother alone? How could she leave her alone when I was gone? when she was ill herself. she left because she was unwell. How is Muna, who has been to see her? who has given my Muna water to drink? she does not need your herbs. why hasn't she come back? to lead her back from her parents' home. This is strange, what do you mean? in that city heavy with light. My sister, tell me Muna is here. Tell me she is upon this earth. Tell me when she will be back. and her eyes, they shine. you will see the mist sinking. Muna isn't dead, tell me she lives. Tell me she is at her parents' home. tell me Muna is here. Tell me when she will be back! She is not here, on this side of earth. She lives where sorrow does not stain. in the gardens of Heavens. Cruel sister. Your words are death. and the chains of life. Life, why did you leave? call her, sister, let me see her for a little while. my queen, let me gaze upon you for a little time. this dirty life has to leave. this blossom of meat has to fall and wilt. My sister, remember, "My chest wants to explode,"
she said. "What will we do with gold?" "It is better to eat nettles and satisfy our souls," she said. and then ruin what you have made. and then drag her down like this? how could you destroy her like this? sister, I thought she would never die. How could the fire take her? hold her to my chest? I want to rub her ashes on my chest. Mother, Muna, I will not stay here. steals into a gentle dream. from the clear world of the living. "What are you doing grass cutter?" for whom to tire my fingers. to build a rest house and a tap for my people. If we do not sow, how will anything grow? And how long will we play with toys? as if they are bright jewels. and this is a ripe field to be cut. I reap my fruit and pay rent to the earth. the rest house and the watering place." Magnetized, the youth stares at him. It is as if lightning flashed. fly into the darkness of the trees. "The worth of this grass cutter's life." is shaken awake, he is shaken awake. two tear drops fall upon the rock. and the hills hum among themselves. heat and thirst are gone today. O these first sounds of Nepal. beneath the skies of my Nepal. welcome like the broken voice of a child. simple, transparent, and filled with light. come down! come down to this earth again! and this whole country has become thirsty again. Why would the smells not be gentle? Why would the world not be bright? 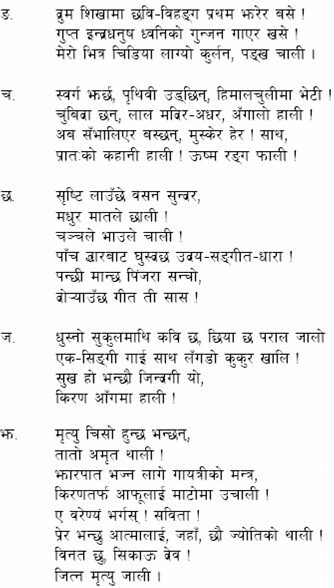 This is the last poem of Mahakavi Luxmi Prasad Devkota. This was written by him in "bramhanal". aayena jiudai rahadaa ti gyaan. na bhakti bho na bho gyan bibek. ma sunya ma sunya sari bilaaye. Let me not jump to the void like a sage. Let me not create distorted magic of variegated colors out of magic less truth. Let me not become a Brahmin to live on dirty water washing away other's sin. Let me not reform to expose the world. Let me reach higher up than the sage.